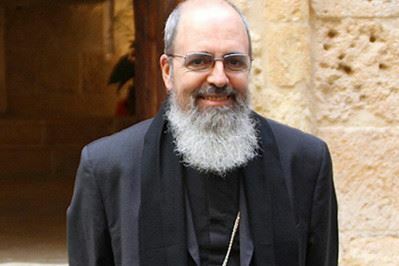 Today, Pope Francis nominated as the new Apostolic Exarch for the Catholics of the Greek Byzantine Church, Reverend Archimandrite Manuel Nin, OSB. This local church has approximately 6000 faithful. Bishop-elect Nin, 59, has served the Church until now as the Rector of the Pontifical Greek College (Rome) and teacher at Pontifical Atheneum of Sant’Anselmo (Rome). The new exarch is the titular bishop of Carcabia, a professed monk of the Abbey of Montserrat, and has been a priest for 18 years. He is currently a consultor in the Office of Liturgical Celebrations of the Supreme Pontiff, a member of the Liturgical Commission of the Congregation for the Oriental Churches, and first assistant to the president of the Subiaco-Cassinese Congregation. May God grant Bishop Manuel many years! On May 2, 2014, His Beatitude Sviatoslav delivered an address at the Institute Metropolitan Andrey Sheptytskyi, Toronto, Canada. He was in the West for a ten day visitation filled with meetings of all segments of the eastern Canadian eparchies. The head of the Ukrainian Byzantine Catholic Church, Sviatoslav, is an incredibly energetic bishop. He’s been dealing with much in the recently with the political problems in the Ukraine, and the growth of the Church all over the world. More on the Ukrainian Byzantine Catholic Church can be read here. Thank you, Ambassador Bennett, for your kind words of introduction. It is so gratifying to see members of the Ukrainian Greco-Catholic Church in Canada like you, Your Excellency, serving their country in such high office. The Ukrainian Greco-Catholic Church is not a Church made up solely of ethnic Ukrainians, as you so aptly demonstrate in your person. It is a Church that comes from the Ukrainian people, but it is a Church that is for the entire human race. I am grateful that your office keeps a watchful eye throughout the world over the issue of Religious Freedom. Please give my greetings to Prime Minister Harper and thank him from me for taking the initiative to create such an important position. In those parts of the world where believers live in anxiety for their future or in genuine danger, they look to democracies like Canada to shine the bright light of Freedom into the darkness of religious persecution and intimidation. Eastern Christians in the Middle East live in clear and present danger. Other religious traditions in numerous countries throughout the world need the reassurance that someone is paying attention to the issue of their religious freedom. The Ukrainian Greco-Catholic Church knows all too well the painful reality of religious persecution and we want to see the great democracies of the world vigilantly protecting religious minorities wherever they are in this world. My purpose this evening is to address the deepest dimensions of what is happening in Ukraine and to tie that in to some things that are now happening and that can happen here in Canada. As I bring greetings to you from a country and a people who are caught, through no fault of their own, in a life and death struggle for their own future, I want to highlight the importance of a faith perspective amid the leadership class. For that is who you are: people of vision, people with talent and the drive to succeed, to build a future rather than just sit and wait for it to arrive. This hall, this Canada Room at the University of St. Michael’s College in the University of Toronto, is filled today with people who understand what is really important. Here, at one of the world’s leading institutions of higher learning, let me state unequivocally why it is imperative that we continue to build not only churches, temples, synagogues, in which to worship the Lord, but also cathedrals of learning in which we encourage human minds to strain towards the absolute. The Lord is a God who wants to be known. In the Divine Liturgy of St. John Chrysostom, we express the absolute transcendence of the creator: “For you are God, ineffable, inconceivable, invisible, incomprehensible, ever existing and ever the same.” And yet we believe that this Creator, who looks upon reality from beyond the “Big Bang,” who so perfectly engineered the Cosmos with forces both unimaginably powerful and unfathomably minute, in a perfect symmetry of gravitational pull and centrifugal power, put us here in this little corner of the universe, for a purpose: to know Him and to beknown. How do we love God with our mind, with all our mind? By striving to know God. And this knowledge needs to be holistic – it cannot be something we do in passing, inattentively, mindlessly. It is an intentional pursuit of discovering God’s plan for the universe: the cosmos of the stars and galaxies, and the vast world inside each human person. The world God has made for us to wonder at, and the human person whom God has made for Himself and for us to love – this is what we are to study, and it is a course of studies that never ends. But even though we will spend our whole lives in a quest for understanding that will be incredibly diverse, this journey of learning has a time of focused preparation. That is why human society pays so much attention to the education of its youngest. From early childhood to the threshold of adulthood, civilized societies demand education. It is not an option, but rather a necessity, and every young person has the right — and indeed the obligation– to study and to learn, and it is our responsibility to give them the best possible opportunities in this regard. If you have your eyes open, if they have not been closed by ideology, shuttered by prejudice, or blindfolded by hubris, I believe you will come to know God in whatever you study, be it physics or finance, literature or law, medicine, engineering, cybernetics or cinematography, or whatever else it is that one chooses to study in a place like this, this university, this universe of learning, where interdisciplinary encounter is hopefully a daily reality. As patriarch [or: As “Father and Head”] of the Ukrainian Greco-Catholic Church, I want to send this message loudly and clearly to all our faithful and to all humanity at large: one of the greatest things that you can do in service of the Lord and in the service of your neighbor, is to acquire a deep and ever-inquisitive knowledge of some part of this amazing reality in which we live. I promise you, if your eyes are open, if your mind is open, you will indeed touch the face of God. And from that encounter you will bring an inestimable gift to the human race. “What about atheists?” you might ask. I believe that atheists who seek true knowledge of any person, process or thing in the universe, without the stumbling block of inordinate pride, have indeed come to know God in a way. Perhaps they simply have a different name for God. For us who stand in the Judeo-Christian tradition, God has a name, revealed to us through no merit of our own. God chose to have a personal encounter with us. We Christians believe that indeed personal encounter is precisely what God is all about: three persons in love with each other, with that love spilling out, (because real love can never be contained) creating and then re-creating the world. If it is true that deep knowledge of anything that can be studied, if pursued in a virtuous fashion, can be life-changing, not only for one’s own self, but for the whole human race, then what can we say about those who choose to seek the knowledge of God directly? The place of theological study within this overall vision needs to be taken very seriously. That is why we are here today, at an event supporting the Metropolitan Andrey Sheptytsky Institute of Eastern Christian Studies. In many places in the western world it is popular today for people to proclaim that they are “spiritual” but not “religious”, interested in things that go beyond the mundane without accepting systems of doctrine, worship or behavior. The fact remains, that many, if not most, of these newfound spiritualties have their roots in, or are connected in some way, with the traditional faith-based vision of committed believers. For those of us who find life and inspiration in our relationship with God, it is of paramount importance to make sure that we are not reducing our understanding of who God is, and who we are before God, to something that is not in the end true. Faith is not based in magic or fantasy or a desire to escape reality. It is about the truth. It is about what is really real, sometimes beyond surface appearances. It is about what is really right, beyond the expediencies of survival in a world that so often tends to brute force. This is why it is a joy for me to share with you certain aspects of what transpired between November 2013 and February 2014 at the Maidan in Kyiv. The media, of course makes endless references to the Association Agreement with the European Union, promised and reneged upon by the former president of Ukraine. This is certainly what originallyprompted university students and other protesters to gather at the Maidan Nezalezhnosti -Independence Square in the capital. But as the government responded with brutality, the protests became much more than the voicing of a pro-European stance, they turned into a national movement to restore human dignity in a society that had been brutalized by a corrupt system that had abandoned the godless Soviet nomenklatura style of government in name only, but not in substance, after Ukrainian independence and the downfall of the Soviet Union. We believers cannot look at the denial of human dignity again and again without reacting. If it is all in the end about loving God and loving neighbor, then human dignity takes on an importance that is so central. It trumps considerations of gain, of personal success, of comfort and a quiet private life disengaged from the issues of civil society. Maidan nezalezhnosti became Maidan Liuds’koyi Hidnosti (The Maidan of Human Dignity). The historical moment that transformed Ukraine in a permanent way was the recognition that in a lived solidarity that transcends ethnicity, language, and even particular religious membership there is a strength that can overcome the sometimes sly, sometimes brutish, always cynical idolatry of power that had held the government in its grips. As we stood our ground and prayed on the various maidans throughout the country, we not only changed the focus of the protests to center on human dignity, we noticed that the maidens became a place of newfound human dignity. Treating one another with love, with compassion, with dignity: that is what breeds dignity. It multiplies rapidly, as one would expect a force of nature to do. What weapons of individual or mass destruction can withstand the loving force of human dignity? We have dignity as human beings because we are children of God and because we are called into eternal communion with God. St. Seraphim of Sarov famously proclaimed: “Acquire the Spirit of Peace and thousands around you will be saved.” That Holy Spirit flowed in broad currents on the Maidan of Dignity. For many it was a nation-building experience. For many more, it was also a religious experience. Representatives of the Roman Catholic, Greco-Catholic, various Orthodox Churches, Baptists, Pentecostals, Evangelicals, and other Christians, Jewish Rabbis and Muslim Imams surrounded the Maidan with prayer. Our people have been praying, praying, praying, in their homes, their parishes, in their workplaces, and at their computer screens, engaged in social media. They have prayed personally and communally. An “ecumenism of engagement” arose on the maidan. As we prayed together in various languages and in various faith traditions, we felt the presence of God. This is not just the naïve persuasion that “God is on our side, therefore we will prevail.” No, this experience of God’s presence was much more nuanced. Many felt in those critical last days before the snipers started massacring the protesters that this night, this hour might be the last hour of our lives. And yet we felt, we saw with some of the clearest vision of our lives, that God indeed was with us. It so happened that what became the favorite prayer of the maidan was the passage from Isaiah: “God is with us, understand all you nations and submit, for God is with us!” Of course, from the great exultation of seeing off an unworthy president who fled the country at a time of crisis, leaving the Ukrainian Parliament to pick up the pieces and institute an interim executive, and a sense of triumph, we quickly were confronted with the reality of Russian aggression in Crimea, and the comfortable West’s inability to respond to this most dangerous development since World War II. Then the events in Eastern regions of Ukraine began, fomented again by special operatives from Russia, the “political tourists” in neat uniform, but without any identifying insignia, whom the people have christened “little green men”. And all this time some 40 thousand Russian troops at the border of Ukraine, to further cloud the minds and hearts of those people who had not yet been set free by the “revolution of human dignity.” And the propaganda war unleashed by Russia is the most twisted informational assault since Goebbels pontificated that if you brashly lie long enough, loudly enough some will inevitably believe you. There is an anecdote circulating in Ukraine: A Russian citizen meets a Ukrainian citizen and asks him: “So, are you one of those ultra-nationalist, fascist anti-semites, who supports the government in Kyiv?” And the Ukrainian citizen replies: “I guess I am, because everybody at our synagogue is!” All joking aside, political humor often makes important statements. This is a blessed time for Ukrainian-Jewish relations. We stand together for the truth. We stand together for a country that has earned to join the family of free and democratic states, through its painfully acquired human dignity. Thank you to the Members of the Ukrainian Jewish Encounter who are here with us today. Last year the Ukrainian Jewish Encounter, facilitated a series of most significant events honoring Metropolitan Andrey Sheptytsky, my predecessor during another vastly more difficult time in history, the period of the two World Wars. It was the idea of Rabbi Jakov Dov Bleich that the All-Ukrainian Council of Churches and Religious Organizations travel to Canada and the USA to honor what Metr. Andrey Sheptytsky did in heroically standing up in defense of Jews at a time when it could have spelled persecution or death for himself or his Church. Personally overseeing the saving of scores of young Jewish people in L’viv and its environs, he exhibited the kind of courage that we long for in our leaders, but so rarely encounter. The unanimous parliamentary resolution in Ottawa and the truly excellent conference put on by the Metropolitan Andrey Sheptytsky Institute of Eastern Christian Studies left us in a state of euphoria, a state of solidarity, and we were full of plans for other such momentous things that the representatives of all of Ukraine’s Churches and Religious Organizations could do together. This, of course, was of utmost importance as we together faced the many unforeseen challenges of 2014. And again we stood and continue to stand together. “Almighty God, and Ruler of the universe, Our Savior Jesus Christ, who love the human race, and with your limitless plan take care of every people uniquely! Look mercifully also upon our Ukrainian people, and on every other people that with full hope comes before you as to their very dear Father and most wise King. We, children of this people, humbly obedient to your will, love all the peoples whom you have redeemed on the Cross with Your Holy Blood, and first of all we love with a sincere Christian love our own Ukrainian people. Thus, out of love for our people, or rather out of love for you, our God, we beseech you. This is the kind of prayer that we need in Ukraine today. A situation like ours can engender so much bitterness. Enmity between nations is a difficult thing to resist in a situation of aggression. It takes deep spiritual equanimity to be able to stand ready to defend one’s homeland without allowing one’s heart to be polluted by hatred for other nations. But this is what we expect of our people. We want them to know that God is with us, and for that reason the Church will stand with the people, but we also want them to understand that God loves the armies and the citizens of Russia, too. How can God love both sides? Let me ask you a rhetorical question. Who could believe in a God who only loves one of the sides? That does not eliminate the discernment of what is right and what is wrong. It does not eliminate the need to stand for justice and truth at the cost of perhaps sacrificing one’s life for it. But human dignity demands from us a respect for every human being and for every nation, ethnicity, and religious tradition. These are children of God we are talking about. When I did my doctoral studies, I decided to focus my dissertation on theological anthropology and the moral roots of theologizing in the Byzantine tradition. Are these not among the most burning issues of today? What does it mean to be a human being? What is moral behavior in this increasingly complex world? We need wisdom in these areas, not just surface knowledge. We need to study these things with our whole mind in order to get to known Him who set into motion all of the processes in the midst of which we find ourselves today. I attended the Sheptytsky Institute Summer program at Holy Transfiguration Monastery (popularly known as Mount Tabor) in California in 1995, a spiritual and intellectual boot camp in which some 15 students from around the world were immersed into the life of an English-speaking Ukrainian Catholic Monastery, with three hours of lectures, six hours of liturgy, and tons of readings and written assignments to do in between. I fondly remember the Abbot, Archimandrite Boniface Luykx, a liturgical scholar who had been a peritus, an expert at the Second Vatican Council. He was passionate about how Eastern Christian liturgy brings us into contact with the glory of God and allows us to experience a glimpse into the Blessed Kingdom of the Father and the Son and the Holy Spirit. As he explained the workings of our liturgical life, he never passed up the opportunity to wax poetic about the “anthropological under-girdings” of a given practice and its theological significance. The anthropological was always so evident. After all, liturgy is meant to draw us communally into a deep relationship with the living God and each other. Another thing I experienced during my month at the Sheptytsky institute Summer program was the love that the Institute’s founder had for the person, the teaching, the example and the wisdom of Metropolitan Andrey Sheptytsky, on whom he had written both his master’s and doctoral theses. Fr. Chirovsky spoke often of antinomy: the paradoxes that lie at the basis of our thinking and knowing of God. Is God one or three? Yes. Is Jesus Divine or human? Yes. Is salvation total union with God or do we retain our personhood. Yes. A hundred well-balanced antinomies, and a hundred positive responses to really important questions. But these answers we not pat solutions to quandaries of major import. They were dynamic, always allowing for more exploration, and always begging the thinker to rise to another level of inquiry, where wisdom rules in place of simplistic facts. Metropolitan Andrey had enjoined his people to pray to God each day for the gift of Divine Wisdom. When you think of the major ethical conundrums that they faced in resisting both the Nazis and the Bolsheviks, can you see how in touch with the needs of his people Metropolitan Sheptytsky was? That is how we should understand the Sheptytsky Institute. Founded in 1986 at Catholic Theological Union in Chicago by the then still very young Fr. Andriy Chirovsky, who was a professor there, the institute was moved in 1990 to Ottawa’s Saint Paul University at the request and under the aegis of the Ukrainian Catholic Hierarchy of Canada, under the leadership of the late Metropolitan Maxim Hermaniuk, himself a biblical scholar and a lover of learning, the first editor of Logos, the Ukrainian Catholic theological journal he founded in 1950. The Sheptytsky Institute resurrected that journal in 1994 after a decade of its silence, renamed and reformatted it as Logos: A Journal of Eastern Christian Studies. It is published regularly to this day in three languages: English, Ukrainian, and French, the only peer-reviewed theological journal published on a regular basis in the worldwide Ukrainian Catholic Church. The Institute from its beginning is very pastorally minded. While it demands intellectual rigor and academic excellence, this stringency is applied for the life of the Church. An intensely ecumenically engaged operation, the Sheptytsky Institute has always been involved improving understanding and concrete relations among the various Eastern Christian Communities, Catholic and Orthodox, and between the Christian East and West in general. Following the lead of its patron, Metropolitan Andrey, the institute is also devoted to inter-religious rapprochement and dialogue, especially with the Jewish Community. These various degrees have been earned by men and women, clergy, religious and lay. Five bishops have passed through the Sheptytsky Institute, three of them Ukrainian Greco-Catholic, but also Melkite and Romanian Greco-Catholic. Many have become priests, and many others are lay leaders. They serve in the Ukrainian Greco-Catholic Church, of course, but also in a number of other Eastern Catholic, Eastern Orthodox, and Pre-Chalcedonian (Oriental Orthodox) Churches. Western Christians: Roman Catholics, Anglicans, Protestants have studied Eastern Christianity at the Sheptytsky Institute. When you see a Muslim student studying the Theology and Spirituality of Icons, you realize that the Sheptytsky Institute is not your grandfather’s type of theological school. It is a centre of excellence in Eastern Christian Studies that is dedicated to the proposition that Eastern Christianity is not only the tradition of our grandparents, but the tradition of our grandchildren and their grandchildren as well. Sometimes diasporas can become closed in on themselves. The diaspora of the Church of Kyiv must not be that kind of phenomenon. Sometimes diasporas look backwards so much at their ancestral homeland, that they forget about taking care of their own life and vibrancy. The diaspora of the Church of Kyiv, must not be like that. I can tell you that your brothers and sisters in Ukraine are deeply grateful to the Ukrainian diaspora in the West for all the support you have shown for decades, but especially in the last few months. We are even more grateful for the fact that you have become such a vital element of the leadership of various democracies like Canada and the United States, because you have helped these countries become the allies of the people of Ukraine in their struggle for freedom and human dignity. That is the proper role of our diaspora: not to live for Ukraine, but to live: to be a strong and lively link between the country that is your home and the country of your ancestry, whether that ancestry is ethnic or spiritual, because, as I have emphasized, there are many non-Ukrainians who are members of the Church of Kyiv and that spiritual ancestry is even more important than ethnic ancestry. For us, the ancestry of Baptism is deeper than the ancestry of blood. You want to help Ukraine? You want to help the Church of Kyiv? Be strong. Be alive, right where you are. Make sure our Church –your Church is dynamic, forward looking, life-giving. No one needs dead traditionalism. What we all need is a living Tradition. The theologian Martin Marty once famously remarked that tradition is the living faith that has come to us from those who have died, and traditionalism is the dead faith of those who are living. Perhaps we should say: of those who think they are alive. The Sheptytsky Institute has a motto: “Serving for the Future, Leading with Tradition.” I endorse that motto. 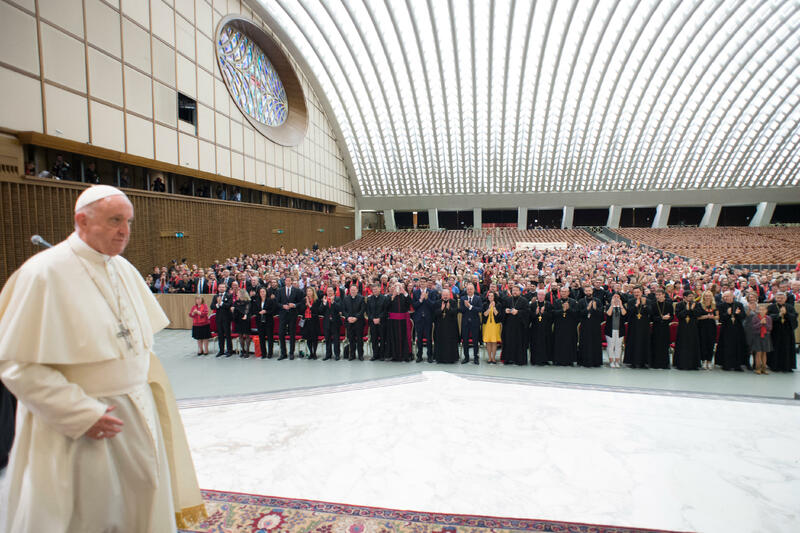 Pope Francis reminds us that the Church needs servant leaders, not just liturgical functionaries. He asks us to leave the sacristy and go into the streets. At the maidan the Church went into the streets. Not to politicize the Church, but to engage society and to stand in solidarity and to serve, where servants were desperately needed. At the same time, the Sheptytsky Institute has been going into the streets of the media and the academy, helping the world to understand what was going on and what continues to happen in Ukraine, through the sometimes wearying work of continually studying in order to understand, and understanding in order to enlighten. The Church needs leaders: clergy and lay. Who will give us those leaders, equipped with a deep understanding of the living Tradition, in order to be able to faithfully and creatively adapt to ever-new situations? In Ukraine we have the Ukrainian Catholic University. In the diaspora you have the Sheptytsky Institute of Eastern Christian Studies. They are absolutely necessary for each other, and we –you and I—cannot do without them. Support this Institute. Ukraine needs to stand up and take care of itself. We are grateful for your help, every single instance of it, and we thank God for you. But for heaven’s sake, please take care of yourself. Make sure that you thrive, rooted in a glorious past, yes, but also striving for a glorious future! You must not only survive, you need to thrive. We in Ukraine need you to do that. Your home country and the western world need you to do that. The Kingdom of God needs you to do that. Why is my first public event during this visit to the Toronto Eparchy at a university? Because I believe that we Eastern Christians, Catholic and Orthodox, have something life-giving to offer to one of the great universities of the world. I believe that the Metropolitan Andrey Sheptytsky Institute of Eastern Christian Studies, which has resolutely proven itself in the last 28 years, is excellently positioned to do the offering. I hope that in the not too distant we will gather again at a similar event to revisit these issues and to see how far we have come along in the realization of this vision. “Serving for the Future, Leading with Tradition.” It’s a lot to live up to. Let’s give it a try. We can do it. Дякую! Thank you! Христос воскрес! Christ is Risen! Pope Francis has appointed the Very Reverend Kurt Burnette, Rector of the Byzantine Catholic Seminary of Saints Cyril and Methodius in Pittsburgh, Pennsylvania as fifth Bishop of the Eparchy of Passaic. Burnette replaces Archbishop William Skurla who was translated to the Archeparchy of Pittsburgh on April 18, 2012 when he was enthroned Fifth Metropolitan of the Byzantine Catholic Metropolitan Church of America and Archbishop of the Byzantine Catholic Archeparchy of Pittsburgh. According to Vatican published statistics, this eparchy has “Catholics 14,729, priests 80, permanent deacons 26, religious 27.” The Eparchy of Passaic was established by the Holy See on July 31, 1963. Bishop-elect Kurt will be ordained and enthroned in Passaic on Wednesday, December 4, 2013. The Holy Father has also appointed Metropolitan Archbishop William C. Skurla as Apostolic Administrator of the Eparchy of Passaic. The Reuthenian eparchies number 4 in the USA. Father David Petras, an archpriest priest of the Reuthenian eparchy of Parma, OH, and now a retired professor the sacred Liturgy at Ss. Cyril and Methodius Seminary (Pittsburgh, PA). Petras gave his a witness to his Byzantine faith, Why be a Byzantine Catholic, at the Parma Assembly 2013. Listen to what Father David says. What I like about Father David’s witness is that he speaks about his experience of faith refracted through a Byzantine lens, a message of love, an experience of God who deifies us; he communicates in a real way that faith is a recognition of God who takes the initiative in calling us to Himself. Hence, the conversion that Petras speaks of is a commitment to the Church to which you belong, the decision to know, love and serve the church; the conversion Father David emphasizes so beautifully means being in love with God!!! What is important to hear in this presentation is that Father Petras had a felt presence of the Holy Spirit, a direct experience of the Divine Majesty. Every Christian, in fact, has an experience of God and ought to reflect upon the ways in which the Spirit talks to you. But you have to listen carefully. It is true that our faith depends on how we personally engage the process of being a mature Christian seeking transfiguration into being a new creation. This is what it means to be a disciple of the Lord: to live in the graces of the Transfiguration on the mount. How will we work out the demands of being good students (disciples) of the Lord depends on our cooperating with Grace. How do we cooperate with Grace? We cooperate with Grace by living in the heart of the Church: faithfully receiving the sacraments of confession and Eucharist, Lectio Divina, study of the faith, being a part of the community of faith in an active way, by being of service to those in need, and by having a healthy humanity. This is a robust faith. Father David sets an agenda item for all of us: to work on a renewed theology of Holy Communion, because through communion we are united with God. He’s not advocating a theology that merely talks about the reception of Holy Communion but a manner of living in communion (Communio) with God, the Church, the self and others. You may want to read his book, Time for the Lord to Act: A Catechetical Commentary on the Divine Liturgy.